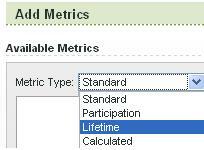 Lifetime Metrics in Omniture SiteCatalyst are one of the most obscure and least utilized features in the entire product – and for good reason. In their current implementation, they do not do all that much. In this post I will explain what they are, how they are meant to be used and offer some suggestions on how Omniture can turn Lifetime Metrics into a more useful feature. Before reading this post, I would hazard a guess that the majority of you reading this have never used Lifetime Metrics and that a good number of you haven’t even heard of them. Most people who hear about them assume that they are metrics that are stored for website visitors for their entire lifetime (or until their cookie is deleted). Unfortunately, that is not correct, as Lifetime Metrics have nothing to do with unique visitors or cookies… When Omniture calls these “Lifetime Metrics” they mean the lifetime of the report suite (data set) in which the metrics reside. For example, if you have a website Success Event for Form Completions, you use a regular Success Event to see how many Form Completions take place each day, week, month, etc…, but you would use the Lifetime Metric version of that Success Event to see the total number of Form Completions that have taken place since they were ever collected in the report suite. As you can see here, the metrics for standard Form Completes is very different than the Lifetime Form Complete metric. Again, this Lifetime metric has nothing to do with Cookies, but rather, it represents the sum total of all Form Completions that have taken place since the inception of the current report suite. So What Can You Do with Lifetime Metrics? You can use these metrics to see how you are doing in the current time period as compared with historical performance. For example, in the report above, it might be interesting to note that SEO is greatly under-performing during the selected time frame (13.5%) as compared to its past performance (23.1% of Form Completes). You can divide Form Completes by Lifetime Form Completes to see how the current time frame is contributing to the overall total. Well…that’s it…just wanted to provide a bit of education about this little known feature and some suggestions on how it might be improved… If you would like to see the change I propose made by Omniture, click here to vote for this idea in the new Idea Exchange (requires an Omniture Account).